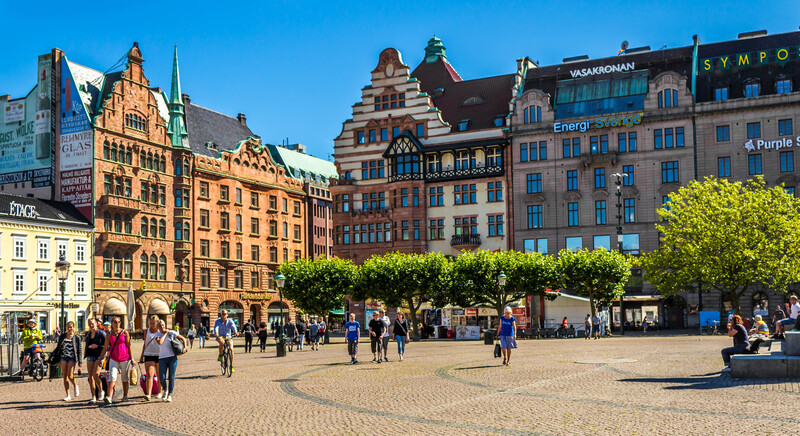 In this blog Shaun Maskrey investigates how Malmö became Europe’s poster child blue-green city following almost 20 years at the forefront of innovative water management. 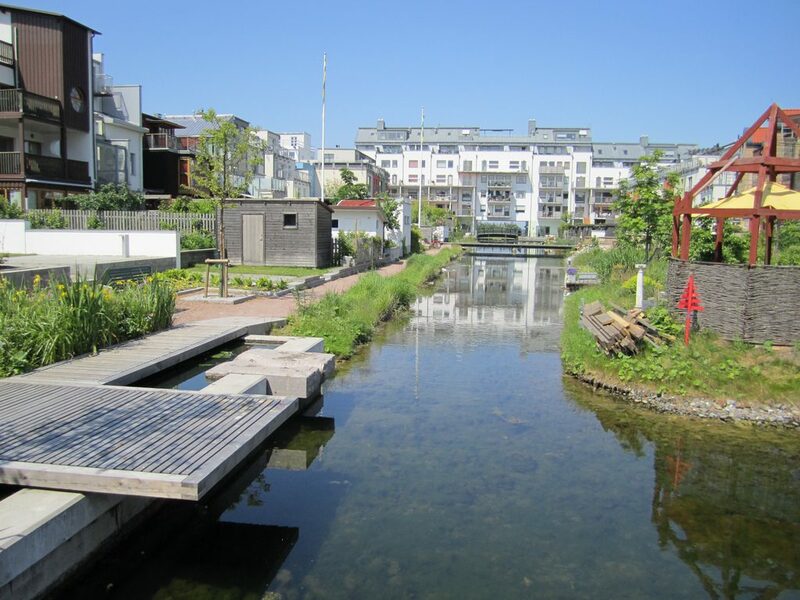 In the late 1990s, after years of socio-economic decline and flooding as a result of overwhelmed drainage, Malmö, and the neighbourhood of Augustenborg in particular, were seeking novel solutions. The changing climate, and an increasing number of autumn and winter storm events, presented the city with a series of runoff management problems. Early regeneration efforts in the suburb of Augustenborg aimed to create a more socially, economically and environmentally sustainable future for the district. Among its many ambitious goals, officials proposed that 70% of stormwater landing on impervious surfaces (roofs, roads, pavements, etc.) needed to be disconnected from the existing combined sewer, in order to eliminate sewer overflow and reduce peak flow rates. City planners and water engineers faced many of the challenges that persist in the UK today. Chiefly, a lack of awareness about sustainable urban drainage systems, and doubts over their effectiveness and value, limiting widespread public participation and support. Other challenges arose during implementation, such as finding space for drainage infrastructure, and addressing the safety issues surrounding siting these features in public spaces and/or near schools. To meet these challenges, physical infrastructure changes from 1998-2002 included six kilometres of water channels and ten retention ponds. Rainwater from impervious surfaces was channeled through trenches, ditches, ponds and wetlands, with only surplus amounts entering the conventional sewer system. Many of these features are visible, and integrated within 30 new courtyard areas, which provide recreational space that can be temporarily flooded. 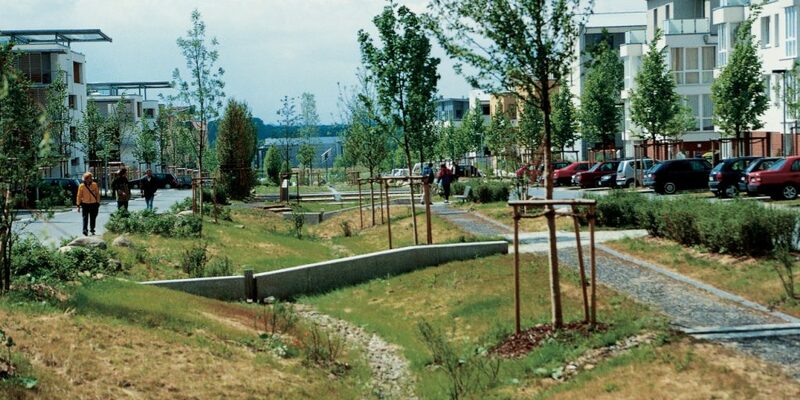 It is estimated that over 90% of stormwater from impervious surfaces is now guided into this open system. Working in partnership with the munipical housing agency, 1600 apartments were renovated and energy efficiency improved by 35%. Cutting edge waste management systems were installed, with Augustenborg becoming the first city to separate food wastes, which are composted and reused in biogas production. Heat pumps, wind turbines and solar panels were also employed to provide electricity and water heating. Green roofs were installed on all new developments built after 1998, and retrofitted onto many existing public and residential buildings. This includes the flagship Botanical Garden Roof, which covers 9,500 square metres, and remains the largest green roof in Scandinavia. It has since become an international centre for green roofs, providing education services as well as a living exhibition space. Throughout the project, residents were given leading roles in its development, with stakeholder engagement events getting them involved in the design of their systems and green spaces. It has since been estimated that one fifth of all residents actively participated. Since the infrastructure changes, Malmö was affected by a 50-year rainfall event in the summer of 2007, which cut the city off from the rest of Sweden. Augustenborg was not affected by this event, suggesting that the new stormwater systems are performing as expected. 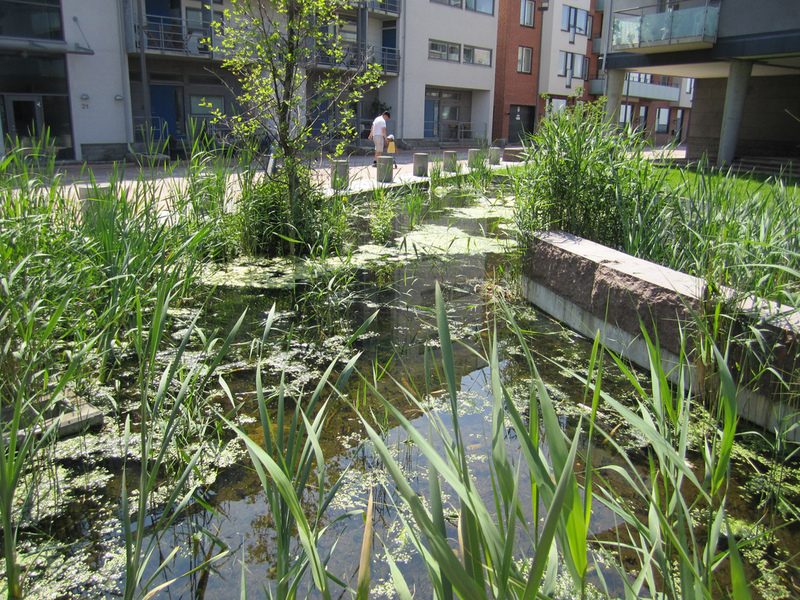 Malmö firmly established itself at the forefront of water management in Europe, demonstrated in 2010 when the community netted the prestigious World Habitat Award from the UN for its pioneering approaches to sustainability. All images used in this blog are marked with a Creative Commons license for reuse with modification on Google Images and/or Flickr.